Recovering from addiction is extremely difficult without the right support. When you try to quit using, you might experience overwhelming physical symptoms that endanger your health. Even after you eliminate the substance from your system, you may experience weeks, months, or years of psychological and emotional distress. Therefore, understanding addiction recovery care can help you decide how to stop letting drugs control your life. How Does Addiction Recovery Care Work? Acknowledging an addiction is often the first step to reaching sobriety. Committing to addiction recovery care is, ultimately, heading in the right direction. If you or a loved one struggles with drug abuse, you might already be familiar with how an addiction rehab center works. For example, a structured program offers a variety of treatment options for addressing the physical and mental challenges accompanying the path to recovery. In the detox stage, patients usually stay at the facility while a team works to support them. The detox experience depends on the substance of choice and longevity of use. Likewise, withdrawal symptoms range from uncomfortable to dangerous. Medically managing the process is often necessary to build a solid foundation for additional treatment. During the detox stage, the patient will also begin working with a counselor to set up a plan for continued care. Additional treatment may take place in an inpatient or outpatient setting. As patients work to better understand their addiction and cope with their responses to triggers, they’ll begin transitioning to sober living. Continuing treatment during this time helps lower the risk of relapse. Although addiction is incurable, it is manageable. Thus, successful recovery may involve avoiding triggers, working with mentors, and sticking with treatment. Lifelong sobriety is hard work. Therefore, people who suffer from addiction need to stay dedicated to recovery. The methods patients use in rehab can transfer to daily life as well. For example, meditation and yoga help individuals manage stress. In addition, support groups provide a compassionate community. Psychotherapy allows individuals to understand addictive behaviors and prevent them from happening. Additionally, we provide long-term care in an effort to help clients set an effective foundation for recovery. 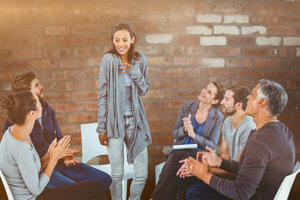 Through psychotherapy, evidence-based holistic approaches, and talk therapy, we help our patients learn how to connect with themselves and others. The professionals at 1st Step Behavioral Health provide transitional care to establish a solid footing to begin the rest of your life. We also offer relapse prevention treatment. However, if you do need to return to rehab, we encourage you to look at it as another challenge to overcome. Relapse is not a failure. Overall, you’ll endure obstacles as you navigate long-term recovery. At 1st Step Behavioral Health, we give you the necessary personalized care to steer you in the right direction after every setback. You never have to go through this journey alone. Discover the best way to begin your recovery path by calling us at 866-319-6126.